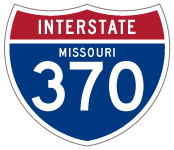 Missouri 370 is a viable alternative from I-270 for Interstate 70 west to Wentzville and Kansas City via the Discovery Bridge between Bridgeton and St. Charles. Photo taken 10/16/04. Three quarters of a mile ahead of Missouri 370 on Interstate 270 by the Hazelwood and Bridgeton city line. Photo taken 10/16/04. Two lanes depart for Missouri 370 west from Exit 22B. Photo taken 10/16/04. Entering the directional T interchange with Highway 370 west to St. Charles from I-270 in Bridgeton. Photo taken 10/16/04. Crossing into the city of St. Peters, I-70 approaches Exit 224 with Highway 370 east. Photo taken 10/16/04. Highway 370 arcs northeast from I-70 back into St. Charles en route to Elm Point and the Discovery Bridge across the Missouri River. Photo taken 10/16/04. A directional T interchange connects Interstate 70 and Missouri 370 at Exit 224. Photo taken 10/16/04. “They built it, and they came: Highway 370, Discovery Bridge have served many purposes.” Suburban Journals of Greater St. Louis (MO), December 12, 2006. Boor, Anthony “Re: MO S.R. 370 and The Boeing Company (was Re: I-180 now more useless than ever! ).” Online posting. December 18, 2001. news misc.transport.road. Dowd, Brian “Re: I-64 st louis experience” Online posting. November 10, 2004. news misc.transport.road. Dowd, Brian. Personal email, May 25, 2004. Dowd, Brian. “Mo Highway notes” Personal email, November 22, 2004.